“Showrooming” is when a shopper examines a product in a store and then buys it online for a lower price, and it’s been steadily making inroads into retailers’ in-store sales. According to an Accenture survey, more than one-third of shoppers (36 percent) said they will shop this holiday season using a mobile phone, smartphone or tablet in-store in order to compare prices. This trend offers retailers a valuable new tool, and I’d say that retailers should be embracing both webrooming and showrooming as opportunities to enhance loyalty with their customers and increase share of wallet. Both are a clear indication of the increasing importance of the mobile channel along the retail path to purchase. And with the increasing use of mobile, there comes new opportunities to enhance customer engagement and deliver personalized messages and notifications that reach customers in the mobile moment – when the products on store shelves are top of mind and when consumers are looking to buy. More than any other channel, mobile offers real-time access to shoppers on a highly personal device that they increasingly have with them at all times. It can provide near-real-time insight into consumers’ behavior on their devices, their location in relation to stores, and their preferred type of communication (push notification, email, text messaging, etc.). 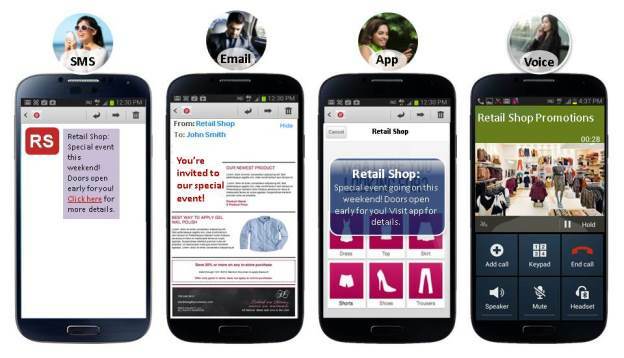 Moreover, mobile offers multiple channels of communication – from text messages to brand apps to social media streams to emails to voice communications – that retailers can use to hold a conversation for a deeper level of engagement. And mobile can be fun. As mobile usage increases, so, too, does the use of games, which naturally lend themselves to mobile environments. Consumer brands can take advantage of the power of “gamification” – using games, or game-like elements – to enter the consumer’s recreational world to help increase loyalty and optimize engagement. An example of a mobile marketing campaign notification using elements of gamification. In this case, scratch-to-win functionality is used to encourage greater redemption of the offer. With that in mind, imagine this scenario. A customer has entered a store looking to try on a pair of jeans. She’s had a look online and seen the pair she wants, but they’re not cheap, so she wants to get an idea of the quality and fit before she makes her purchase. Her plan was to then go home and find the best deal online. 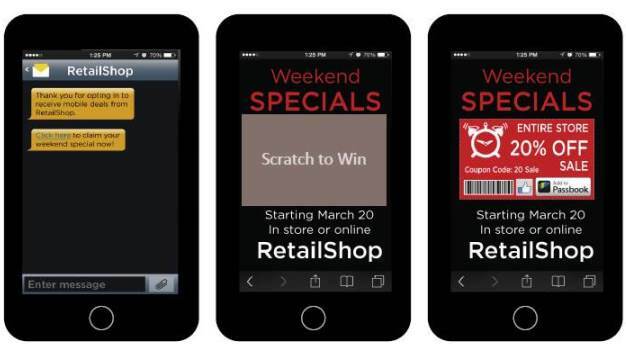 But while she’s in the store, she sees a promotion offering a chance to win a prize to win a shopping spree for anyone who downloads the retailers’ app. So she downloads the app and heads off to do her price comparison online. But now the retailer has her details, and, if she’s given permission, access to her mobile context data – information on her location, usage patterns and opt-in preferences. Fast-forward a couple of months later, and the holidays are approaching. Over that time, the retailer has built up a profile for the customer, and the retailer can start sending her personalized notifications, offers and coupons based on that mobile context and in line with holiday promotions. And the retailer can send those promotional messages with its app, or if she’s opted in, a text message, email or call, when the retailer knows she’s near a store. An example of how a marketing message can be consistently delivered across multiple mobile channels for a seamless customer experience. So while that customer may or may not, depending on the price, have made her jeans purchase elsewhere, the retailer now has acquired a new customer and earned her loyalty through personalized communications. That’s the power of mobile, and one reason why retailers should look to embrace showrooming and webrooming. Do you agree? Do you see showrooming as an opportunity or a threat to retailers? I’d love to know what you think and get your comment. Gary Long is a former Sales Executive Director at Syniverse.